Who goes to Palm Springs on Weekend One of Coachella and doesn't attend the festival? This girl, apparently, and no one else. The city was a ghost town, in a good way. I didn't plan on doing anything this weekend, considering the last one was pretty eventful and a big part of me was looking forward to spending all of Saturday and Sunday working in bed. But then an old friend called (always the case) on Thursday morning and said she'd be flying in to town in just a few hours, and I should join her in Palm Springs for a day or a night or something, so I did join her--for two days, and two nights. I drove out to the desert Friday night and arrived around midnight. My second trip to Palm Springs--first time consisted of a day trip to Sparrows Lodge, which is lovely, by the way, and a Five Leaves Burger at King's Highway at the Ace--was unrushed, peaceful and included playing a CD my dad made me on repeat because not one radio station worked for the majority of the time we spent in the car. With everything going on lately, a girls' weekend with terrible cell service and endless chit-chat with a friend of 12+ years has never been more warranted. On Saturday, we brunched at The Farm in downtown Palm Springs. It's a cute little outdoor spot that's kind of hidden by a wedding chapel. I was nervous about taking pictures in the restaurant because there was a no cell phone zone sign outside (and I can be weird/awkward). It probably just meant no phone calls, but I took it to mean no anything and would drop my phone every time a server walked by. Stopped in at Koffi for, well, a coffee before heading out to Joshua Tree. It's a cute, quick, no frills spot, but it has an awesome shared courtyard just outside the back door with these cool benches and lots of trees/flowers for anyone and everyone who wants to hang around in the sunshine (us!) and be lazy while drinking coffee and gossiping. Joshua Tree was about an hour drive from Palm Springs. 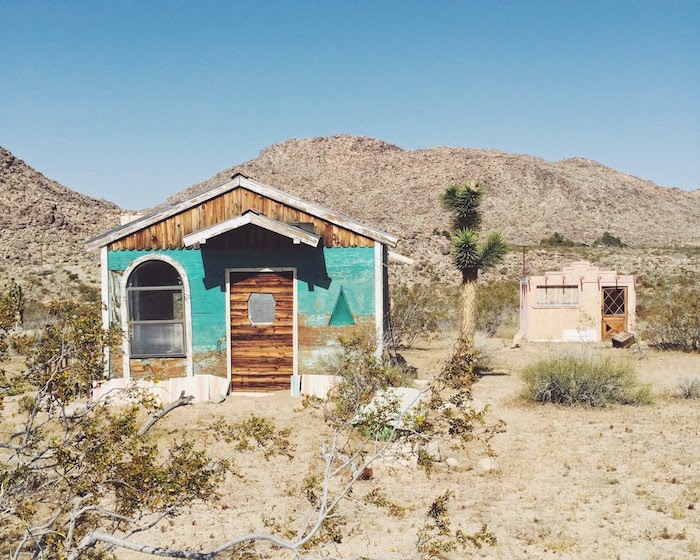 There are a lot of dirt roads, and yucca brevifolia (the plant species that's more commonly known as the Joshua Tree) along the way. Also, some very cute, colorful, rundown houses that are straight out of Breaking Bad and probably also used solely for cooking meth. 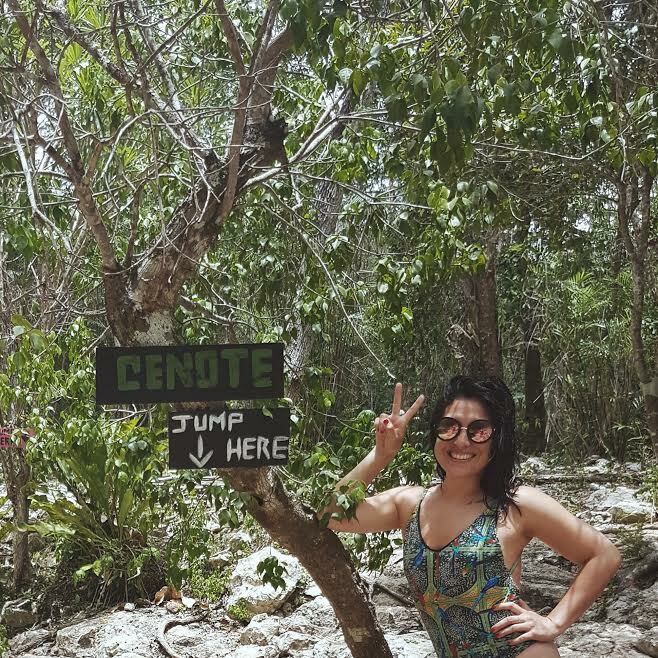 We paid no mind to possible danger and stopped for photos (see all the way above). Once in the park--which has a $15 entrance fee per car, valid for 7 days--everything looks about the same minus houses, obvi. 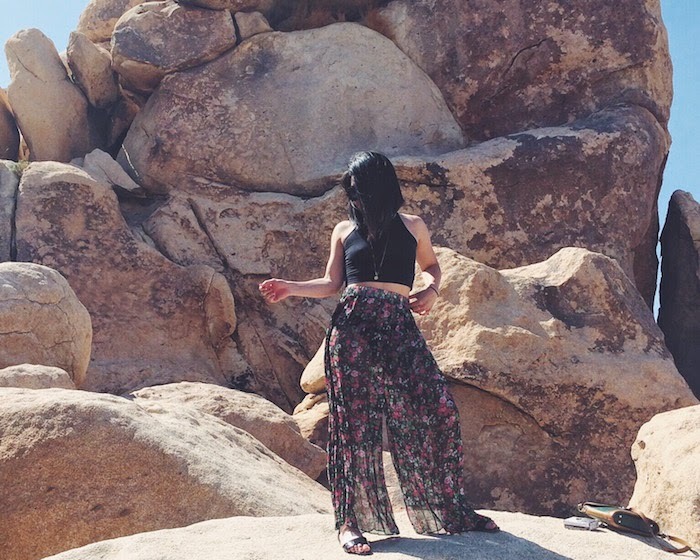 Lots of Joshua Trees, and huge piles of rocks, some of which we attempted to climb, while outfitted in crop tops and sandals. 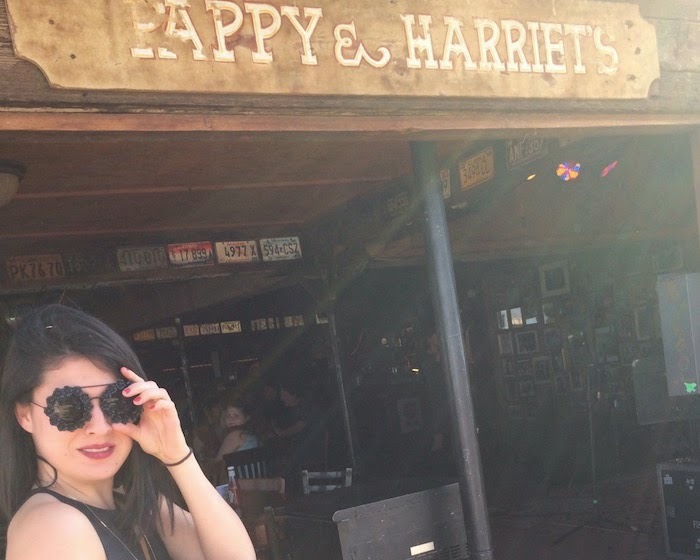 Next on the list was Pappy & Harriet's, an authentic, good time honky-tonk bar in Pioneertown, where the Stones (or certain members of the Stones) are rumored to have played some years ago. I don't have proof of this--just a comment that was made by a bar patron. A few sips into our first beers, and a gray-haired man sitting nearby complimented my friend's backpack. I can't remember his name, but I do know that his woman's name was Karen because he kept talking about her while she was outside smoking a cigarette with some biker dudes. He said they'd been together 15 years (six of which they were friends only). "There's nothing as romantic as dancing under the stars," he said, and then asked the bartender for a water. “I love to dance so much, my email is even danceman100." I told him to stop being so cute, because he was going to make me cry, and then Karen came back in to say that she was ready to leave. “Your husband was just telling us how happy you guys are," is all my friend needed to say for Karen to warm up to us. "Oh, we're not married," she said, and smiled. "So that might be the secret..." She trailed off and he chimed, eager to be heard, "But maybe we'll get married someday. Maybe we'll get married here." Doesn't matter if beer is overpriced, or if food doesn't come out as hot as you'd like it to to come out, or if you have blisters on the backs of your feet because you wore the most stupid sandals to the rocky desert, shared moments with old and new friends, and conversations with people like Karen and her hubby-boyfriend make trips like these worth it every time. 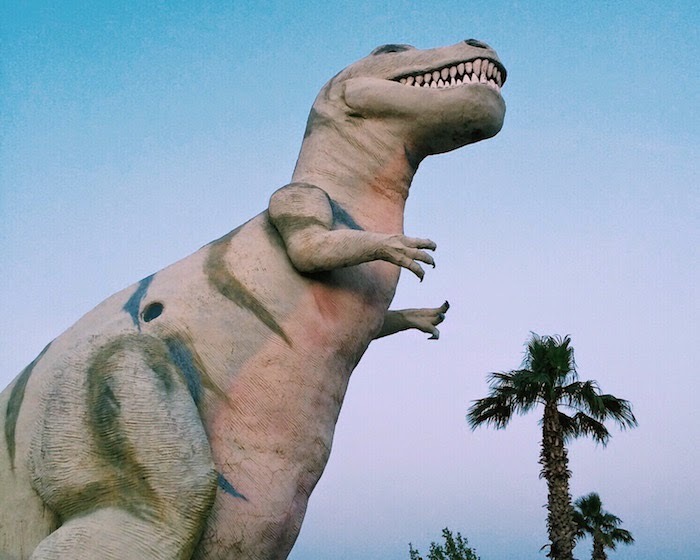 We couldn't stay in Pioneertown forever, although I wanted to, so we took off back toward Palm Springs to visit (some of) the "World's Biggest Dinosaurs" at a roadside spot next to a Burger King. The indoor museum was closed by the time we arrived, but that's OK, because I really just wanted a picture where I look like an ant sitting on a dinosaur's toenail. Dinner: Everyone's gotta have it. And no, room service doesn't count. 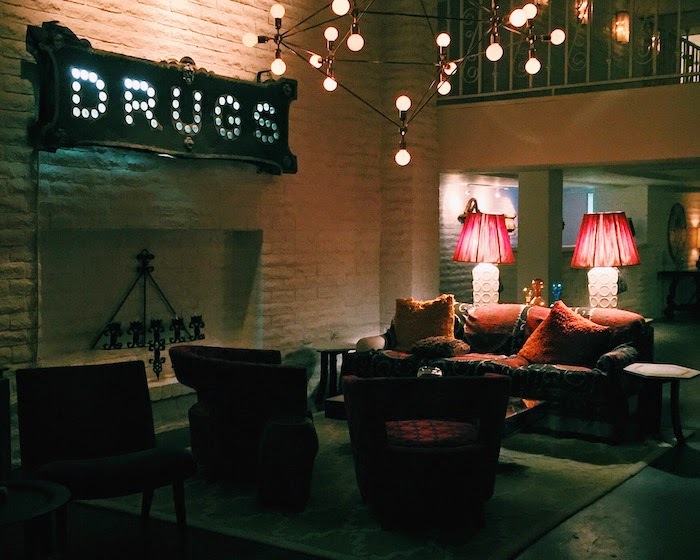 So we went to Le Parker Meridien, the Jonathan Adler-decorated hotel with a yummy indoor/outdoor restaurant called Norma's that was delightfully quiet (literally, the only other person eating while we were eating was Kate Bosworth, and she looked really pretty). The service was amazing, and for the second time on this trip (first was at the Farm), the server discounted our bill for "taking so long" to get us our drinks. He really didn't take long at all. On Sunday, we attempted a French breakfast at L'Atelier Cafe, because of its almost-five star rating, but when we got there, we realized it was tiny and packed and we probably wouldn't get a table for a long time, so we went to Cheeky's instead, where the wait was also forever long. At that point we'd walked for so long that we just settled in with a couple mimosas/Bloodys at Birba next door. We would've probably eaten there instead of at Cheeky's, except all they had that day at that time was alcohol. Their pizza oven wasn't working and their barista didn't show up, which was all unfortunate, considering it coulda/shoulda/woulda been one of their busiest days of the year. After brunch, the girls went back to Coachella, with their fringed tops and flower crowns, and I drove back to LA. I was a little sad because Palm Springs treated me so well, and I was always quick to be like, "WHAT is there even to do in that place besides golf?" There's a ton to do, and I was wrong. The more chances I give California, the more the state seems to pleasantly surprise me. Compiling my list for next time. I'm a little bit in love.